Angel Toast, for face-up, modds, and now for unique BJD heads! Read about Andrea (elisa_maza) and check out her work HERE. The new Kerli music video for the Almost Alice (Music inspired by the Motion Picture) album has been released. The video features dolls from Goodreau Dolls, LLC. The video can be seen HERE. Doll artist Paulette Goodreau went to the set for the video. The short article of Paulette’s account can be read HERE. 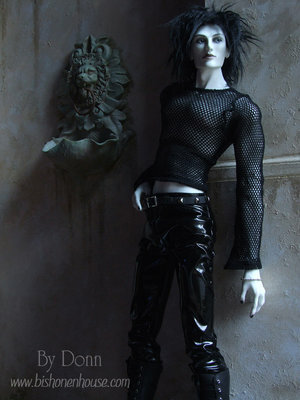 Photos taken by Paulette on the set can be seen in the BJDcollectasy gallery HERE. To check out more of the latest BJD News, go HERE. The creator of the Men of Bishonen House, Donn (Donald Kinney), in a special interview. Check it out here. Gallery of Bishonen House Photos can be seen HERE. Donn Kinney of Bishonen House has just released his new Limited Edition Logan. The doll will come signed by the artist and numbered. He is available with or without face-up and blushing. If he is purchased with painting, he will have his seams removed and be shipped with eyes and brown wig. Additional expression face-plates will be available soon. There is a waiting list for the doll. To be added,contact Donn through the company website. The first dolls will ship in April. To read the rest of Today’s News, GO HERE . American BJD manufacturer Bishonen House has just released a softcover book with 65 photographs of dolls, one of which, a private commission, has never been seen by the public. Also included in the book is a brief interview with the owner and creator of the dolls in which he discusses his sculpting techniques. The book sells for $25 with $5 for domestic and $10 for international shipping. For now, this site will continue to show HIGHLIGHTS a few time a week, but all the remaining news for the day will be available on the NEW SITE. The new version of Collectasy, now called BJDcollectasy, is done! The new site offers more features. There are MORE LINKS to companies, retailers, forums, and buy/sell/trade sites. There are MORE PICTURES in the articles and the GALLERY, and new DIY video projects. Our Favorite Face-up Youtube Videos! Bored? Watch BJD Videos on Youtube!